We have received 28 reviews of Greta Zargo and the Death Robots from Outer Space . You can add a review or scroll down to read reviews. To send in your review of Greta Zargo and the Death Robots from Outer Space , please fill in the info below and click the button labelled Send Review Now. Reviews will be checked by our team before they appear on the website. Your last name will not appear on the site, but we need to know who you are in case you win a prize! 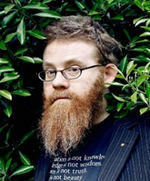 A. F. Harrold is a poet and an author. He writes and performs poems for adults and children, in all sorts of places including schools, and at festivals. He is the owner of many books, a handful of hats, a few good ideas and one very large bushy red beard! His favourite book is The Hobbit, because it hooked his imagination and tangled him up in its world. He also has a soft spot for the villainous Mr Twit, mainly because of his beard! He became a writer because writing poems as a teenager was the only thing that felt right. Every now and then one of his poems isn’t so terrible, and now even stories seem to happen as well. Greta Zargo is an unusual 11-year-old. An orphan, she’s lived on her own since the age of 8, thanks to an unfortunate but legally-binding error on her parents’ otherwise carefully thought-out will. A junior reporter on the local paper, Greta is determined her summer scoop will be solving the mystery surrounding a series of cake thefts. Meanwhile, in outer space, a huge space-going robot is heading towards Earth to take over our planet. The two stories zing along in parallel before coming together beautifully at the book’s climax, and thanks to another typo on a key document. Fact 1: We could not find out what A. F. stands for. Can you? Fact 2: A. F. is the author of other children’s books, with crazy titles including Fizzlebert Stump: the boy who ran away from the circus (and joined the library). Fact 3: His book called Imaginary was on the 9-11 age category Leeds Book Awards 2015 shortlist, and everybody loved meeting the zany Mr. Harrold at the ceremony. I do like this book in some bits but there are some tricky words.It makes me quite hungry because there is cake in it and I LOVE cake! For some reason I find Greta quite funny.This book makes me laugh and I do enjoy it apart from some of the words that are really tricky and I've never heard of. I must say thank you for making this book and I did quite enjoy it. Alfie gave Greta Zargo and the Death Robots from Outer Space 4 out of 5 and now plans to read Me and Mister P by Maria Farrer. Sadly, I found this book extremely confusing however I did like the cake mystery a small amount. I thought it was hard to understand because a lot of things were happening at the same time and it was also quite boring. Now all I have to do is vote. Maisy gave Greta Zargo and the Death Robots from Outer Space 1 out of 5 and now plans to read Amelia Fang and the Barbaric Ball by Laura Ellen Anderson. I really liked this book because the robots are really funny. They take over the world. My favourite part was where we got told where the robots live .Also,I really liked the cake because it looked yummy and I wanted to be in the book! Eleanor gave Greta Zargo and the Death Robots from Outer Space 5 out of 5 and now plans to read The Incredible Dadventure by Dave Lowe. I liked the cake best because it was the most delicious part of the whole book and it was super funny. My favourite character was Greta because she was incredibly clever and had very interesting ideas about her cake mystery...! 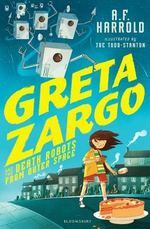 ishbel gave Greta Zargo and the Death Robots from Outer Space 4 out of 5 and now plans to read Amelia Fang and the Barbaric Ball by Laura Ellen Anderson. It is a very good book. It has a great mystery to the story. It makes you want to read more books. Mia gave Greta Zargo and the Death Robots from Outer Space 5 out of 5 and now plans to read Me and Mister P by Maria Farrer. This book is a bit weird because of the crazy words they are also hard to pronounce. My favorite character is Jonathon.Reading this book made me hungry. Charlotte gave Greta Zargo and the Death Robots from Outer Space 2 out of 5 and now plans to read Knighthood for Beginners by Elys Dolan. Savannah gave Greta Zargo and the Death Robots from Outer Space 4 out of 5 and now plans to read Amelia Fang and the Barbaric Ball by Laura Ellen Anderson. Usaid gave Greta Zargo and the Death Robots from Outer Space 5 out of 5 and now plans to read Me and Mister P by Maria Farrer. I like it because it is funny and there was weird and wonderful characters. I would recommend the book to over kids. lauren gave Greta Zargo and the Death Robots from Outer Space 5 out of 5 and now plans to read Knighthood for Beginners by Elys Dolan. I thought this book was a bit boring however I liked the cake mystery a bit. I also thought it was quite confusing because there were lots of things happening at the same time. Holly gave Greta Zargo and the Death Robots from Outer Space 1 out of 5 and now plans to read Knighthood for Beginners by Elys Dolan. When i skimmed the book it didn't appear to be very interesting but when i actually read it, it came to about 3 out of 5 stars for me. Patrick gave Greta Zargo and the Death Robots from Outer Space 3 out of 5 and now plans to read Knighthood for Beginners by Elys Dolan. I enjoyed the book a little bit but not very much because it seems to go on forever and ever so I wouldn't recommend it to any one under the age of 10. I gave it 1 star because it was about a mystery, 1 because it was inspiring and 1 because it had cake involved. I wouldn't recommend it to anybody under the age of 10 and 20 I think that it would be good if you are a CSI ( crime scene investigator ) you would enjoy it but I still don't really like it. Madi gave Greta Zargo and the Death Robots from Outer Space 3 out of 5 and now plans to read Amelia Fang and the Barbaric Ball by Laura Ellen Anderson. The book is adventurous and good for people who like funny stories and has words for people over 7+ and is about a girl who saves the world. When she turned 8 she moved into her parents house and got a job. Also, its a amazing book overall. Children will like the book if they like humorous things and also random things happen in the story. I would recommend this book for people who like humorous and adventurous stories. I rate this book 5 out of 5 stars! Harrison gave Greta Zargo and the Death Robots from Outer Space 5 out of 5 and now plans to read Knighthood for Beginners by Elys Dolan. I didn't like this book because I don't like Robots and scary books. Rian gave Greta Zargo and the Death Robots from Outer Space 1 out of 5 and now plans to read Amelia Fang and the Barbaric Ball by Laura Ellen Anderson. Isabelle gave Greta Zargo and the Death Robots from Outer Space 3 out of 5 and now plans to read Attack of the Alien Dung! by Gareth P Jones. This book made me drool [not really].It was funny how she was in one problem and a problem to save earth.I liked how she jumped to conclusions.It must have taken guts to ask the old lady if she ate it. I wish one of my family was an inventor.I loved it!!!!!!!!! Yusuf gave Greta Zargo and the Death Robots from Outer Space 5 out of 5 and now plans to read Amelia Fang and the Barbaric Ball by Laura Ellen Anderson. Jacob gave Greta Zargo and the Death Robots from Outer Space 3 out of 5 and now plans to read Amelia Fang and the Barbaric Ball by Laura Ellen Anderson. I loved this book it was amazing. Lily-Rose gave Greta Zargo and the Death Robots from Outer Space 1 out of 5 and now plans to read Amelia Fang and the Barbaric Ball by Laura Ellen Anderson. I don't really like this book because it is really confusing and boring but sometimes it can be good. Keeley gave Greta Zargo and the Death Robots from Outer Space 2 out of 5 and now plans to read Amelia Fang and the Barbaric Ball by Laura Ellen Anderson. I really liked Greta Zargo. I liked the ideas and the names. I liked the way she was in one problem and getting in an even bigger one. I really want to read the next one! Serea gave Greta Zargo and the Death Robots from Outer Space 4 out of 5 and now plans to read The Incredible Dadventure by Dave Lowe. I liked the book because it was mysterious. It was sad but I still liked the book! Jamie gave Greta Zargo and the Death Robots from Outer Space 1 out of 5 and now plans to read Amelia Fang and the Barbaric Ball by Laura Ellen Anderson. I'm not sure this book was for me. I didn't really enjoy reading about the space robots. I'k not into sci-fi! However, I did like Greta Zargo's Aunt - she was quite a character and was quite funny. Francesca gave Greta Zargo and the Death Robots from Outer Space 3 out of 5 and now plans to read The Incredible Dadventure by Dave Lowe. It was a good book, it was really exciting. I think the book should have a different name, it should be called 'Greta Zargo and the Mystery of the Missing Cakes'. Ruairi gave Greta Zargo and the Death Robots from Outer Space 5 out of 5 and now plans to read Knighthood for Beginners by Elys Dolan. I absoloutley loved it because there is a lot of DESTRUCTION !!!!!!!!!!!!!! Elio gave Greta Zargo and the Death Robots from Outer Space 5 out of 5 and now plans to read Amelia Fang and the Barbaric Ball by Laura Ellen Anderson. I love this book because there is alot going on instead of just one thing. I also like all the mysterys and solving them. It's intresting how everything all fits together at the end. KATIE gave Greta Zargo and the Death Robots from Outer Space 5 out of 5 and now plans to read Me and Mister P by Maria Farrer. This book was full of surprises and I didn't know what the Prime Minister was going do next. It got me thinking about aliens and whether or not they are real. Nadia gave Greta Zargo and the Death Robots from Outer Space 4 out of 5 and now plans to read Knighthood for Beginners by Elys Dolan. I liked that it had an adventure part in it and it kept me guessing as to what was going to happen. It was exciting and I couldn't put the book down. Carlos gave Greta Zargo and the Death Robots from Outer Space 5 out of 5 and now plans to read Amelia Fang and the Barbaric Ball by Laura Ellen Anderson.